The self-titled debut EP by Helsinki's Verandan is less than two weeks away, but apparently main man Ville Hopponen decided that was enough time to release another song. So enjoy "Follow The Money" while waiting for Soliti Music's release of the EP. The song is a sprawling, dreamy arrangement showcasing a meditation on the effect of economic dislocation on community. Soliti Music page for "Follow the Money"
Bandcamp for "Follow the Money"
We really hate it when we miss the release of a really good indie pop record. In our defense, it isn't easy to follow all of the indie releases around the globe. But it is our job to do so and it becomes harder to justify our high salaries, stock options, private aircraft, bodyguards and other perks if we don't do it well. And failure also makes for awkward conversations with outside directors and angry institutional investors. However, we shouldn't complain, as most people would be happy to trade places with high-flying indie music bloggers like us. So, then, what did we miss? Absolutely nothing, of course, we are professionals. 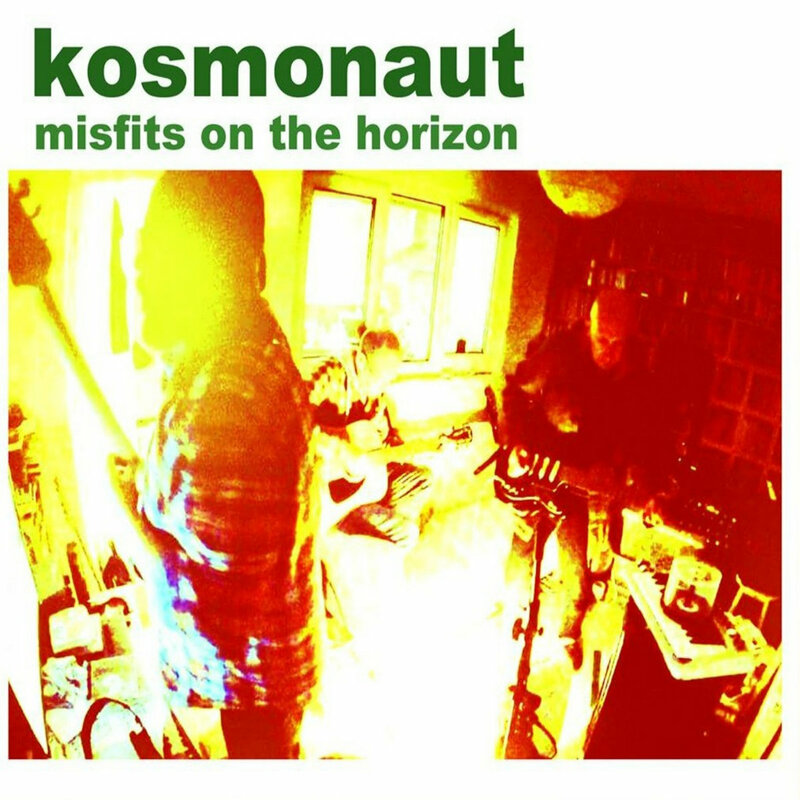 But we almost missed Misfits On The Horizon by Kosmonaut. The nine-track gem of guitar and electronic-pop was released this month and deserves to be featured here. And if not for spying a post by Wally Salem of Canadian label The Beautiful Music, that might not have happened. To put it simply and directly, Kosmonaut may be one of the best bands you've never heard of, writing the sort of songs that reflect the cool college vibes of Teenage Fanclub and the heyday of Creation Records, The Weather Prophets, early Primal Scream and some sunny psychedelic pop (check out "Dive In Blind" and "Your Day In The Sun"). And for those who detect some of our beloved Bulldozer Crash in the bloodline, you may have hacked a bit of their DNA profile and found Stephen Maughan). Suffice it to say that Misfits On The Horizon is the work of absolute pop masters, likely with divine inspiration . Giving you streams of four songs from a single album seems excessive, but it was painful enough to cut as deep as I did. I suppose if you only have time for one, listen to "Debbie Harry's Smile" or "Silver Star". I know we have been (trying) to spend a lot of your money lately, but listen to Misfits On The Horizon and think about living in a world in which you can't play those songs whenever you want. We'll have more music for you later today, but we are starting out with a new song from The Treasures of Mexico. And that generally means two things in the music business, very good new music, and an upcoming album. We celebrate both, but first focus on this bubbling gem of guitar pop. Upbeat and featuring excellent guitars, it is one of those tracks that make a sunny fall day here even better. The Treasures of Mexico are Mark Matthews and Bob Collins, formerly of The Dentists, and Russ Baxter. We have no details on the album yet. If you want to hear more from the band while waiting, here is a link our feature for their 2015 album via Shelflife Records. We don't have much time to write today, but fortunately Columbus, Ohio's The Halamays have bailed us out by offering this very sweet record, simply named EP2, for 'name your price'. The band are Katie and Patrick Watkins, who not only make music together, but are married. We think you will like them and their music, so enjoy! Our favorite New Zealand children, Astro Children, are preparing a new album titled Turnpike. Our first hint of the aural delights is "Straight For My Heart". Aptly named, we think, as we tend to take this band's music to heart. Astute readers will note that the song is available as a 'name your price' download. The rest of you will wander around in customary silence. Astro Children are Millie Lovelock (vocals/guitar) and Isaac Hickey (drums). Mick Trouble - It's The Mick Trouble E.P. Legend has it that Michael Toomey-Head is a legend. Well, maybe not a Michael Toomey-Head, but as singer-songwriter punk Mick Trouble, he and his band were tipped for great success in the early '80s. Still then in his teens, Nick dropped out of sight. Story over, another one bites the dust - right? Well, not quite. It seems that Mick discovered a high quality recording of his 1980 EP, It's The Mick Trouble E.P. Somehow Flagstaff's Emotional Response Records prevailed in the high stakes competition to release the EP, and here we are with a four-track statement of pop punk excellence and talent too long out of our reach. Fans of Nick Lowe and The Jam will appreciate the fusion of punk attitudes, sharp songwriting and melodic expression. And in case anyone is wondering whether we can resist streaming a song entitled "Shut Your Bleeding Gob You Git", the answer resides below. Of course, none of us can do anything about Mick bowing out of the industry when he did. But this EP is really great stuff, and you now can have a thrilling artifact of the legend-to-be-that-was-not. It will make you happy, then sad, and then happy again. We recommend it. The Bandcamp gets you digital. Very limited vinyl is available via Rough Trade in the UK and Emotional Response Records in the US. 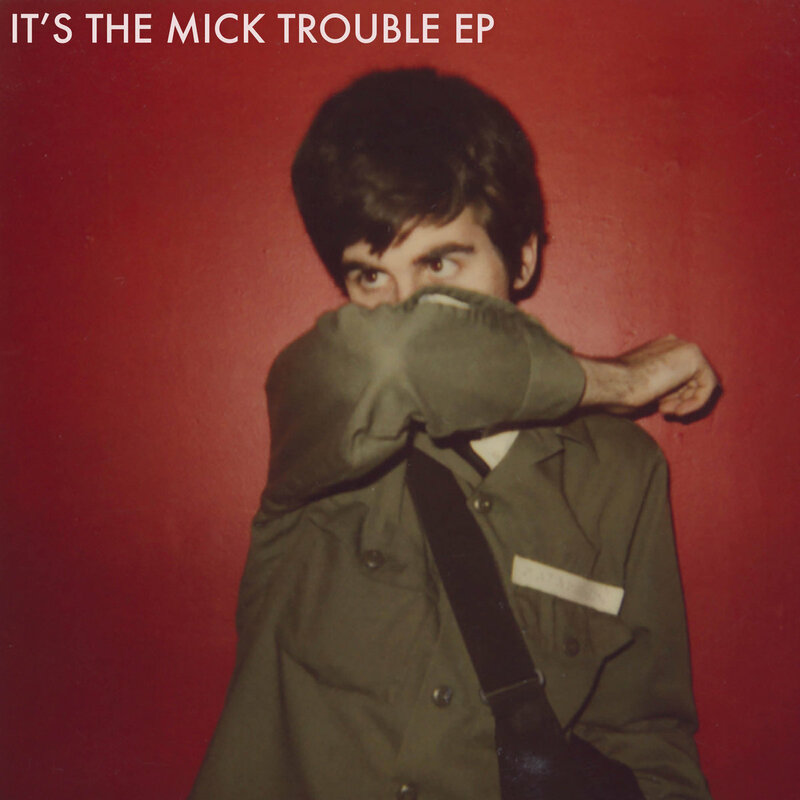 Bandcamp for the It's The Mick Trouble E.P. We're here to discuss an album by Holiday Ghosts, a band from Falmouth, UK. But even before cuing up the album, we began to ponder just what the name meant. Are holiday ghosts the ghosts that specialize in haunting your holidays, despite your desire to 'get away from it all'? Or are holiday ghosts the ghosts of your last disastrous holiday, here to remind you that you spoke too sharply to your spouse, failed to get the exercise you had promised yourself and drank your booze provisions for the week by noon on Wednesday (put your hand down, this isn't a confessional)? I suppose it could be either, but we prefer a third alternative. We like to think that holiday ghosts are nothing more, and nothing less, than ghosts on a holiday, having fun and enjoying each other. After all, shouldn't hard working ghosts deserve some time off like the rest of us? Of course, being analytical types we should offer some evidence for our preferred explanation. Our evidence is the self-titled, 12-track debut LP by Holiday Ghosts. Assembled from carefully curated bits of roots rock, garage pop, punk and a few touches of glossier material, you would be hard pressed to find many more joyful expressions of stripped down, just-for-fun, guitar pop in 2017. Our first introduction was the frank and darkly witty focus on unsettled mental states, "In My Head". Once we got the album we couldn't stop moving our feet to the garage pop of "Walk For Hours" and "Quiet Carriage", followed by the bouncing punk pop of "Airwaves". The roosty strut "Staring At the Moon" (one of our oft repeated songs) leads to the aforementioned "In My Head". "Paranoia" is our second dose of raucous punk, and we expect it is a staple of live shows. The next song, the lovely "Truman Show", is the album's most pop song and, led by Katja Rackin's breezy vocals, hints that the band's range may be even wider than this varied album shows. Garage rock is back on the menu with the racing "Nothing to Show (Nowhere to Go)". It is followed by the standout "Sleep Through The Morning", which sounds like it was plucked off a nuggets compilation somewhere in the neighborhood of the 13th Floor Elevators -- and we mean that as a high compliment. Next up is one of the album's most beautiful moments, "Ron Song". We don't know Ron, or what he did to earn this song, but we hope he deserved it. The mid-tempo, '60s shaded "At the Same Time, Every Night" is rapidly climbing our interior charts, but we'd have agree with the band's choice of closing with the garage rocker "Can't Bear To Be Boring", featuring a driving rhythm and Katja's talk-sing backed by the guys in chorus. It is just the sort of song to bring calls for "encore". And speaking of encores, you can stream Holiday Ghosts at the Bandcamp link at the end of this post. If you haven't figured it our yet, we'll make it even clearer: This album is terrific. We have had it on our daily rotation for over a month, and it isn't getting deleted now that we are posting the review. The energy, songwriting, and performances all are stellar. This is a smart band, but doesn't make a big show of telling you how smart they are. You just know after listening. And we have to give a special shout out for the excellent and varied guitar work on this recording. Holiday Ghosts are Sam Stacpoole, who we first met as the frontman for The Black Tambourines, Katja Rackin, and Charlie Murphy. Holiday Ghosts is out now via PNKSLM Recordings. See the links below for details.